When it comes to Japanese restaurants, there's a school of thought that suggests the smaller, the better. The three Michelin-starred Sukiyabashi Jiro in Tokyo has counter seating for just 10 people. Melbourne's newly two-hatted Ishizuka has elegant seating for 14. Tetsuya's Tetsuya Wakuda has long dreamed of opening an intimate restaurant of just six or eight seats, in recognition of that special act of communion between chef and diner. And then there's Sake Manly, which clearly adheres to another theory; that bigger is better. 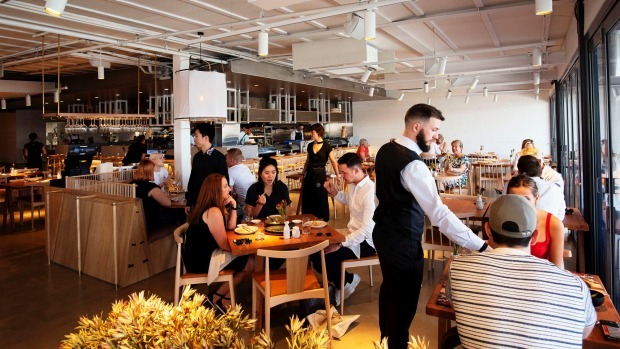 So Rockpool Dining Group's new baby – sixth in the Sake Restaurant & Bar family – is a whopping 300-seater stretched across the rooftop of the newly renovated Manly Wharf, cleverly broken into different zones by design team Luchetti Krelle. The sushi counter alone seats 40, the bar and lounge area, 60, and the alfresco terrace, 50, leaving another 150 diners across a vast-light-drenched dining room and a series of private dining pods. It's a blur of action and noise on a Saturday evening as black-frocked staff ferry platters and cocktails past gorgeous views of Manly Cove and incoming ferries. Former Sake chef-turned-consultant Shaun Presland worked with head chef Shoji Toru to create the new menu, before returning to London to open his own new Soho restaurant. The menu ticks off all the Sake favourites – sushi, sashimi, popcorn shrimp, those fluffy shumai dumplings and spider maki rolls – and introduces some intriguing new dishes. 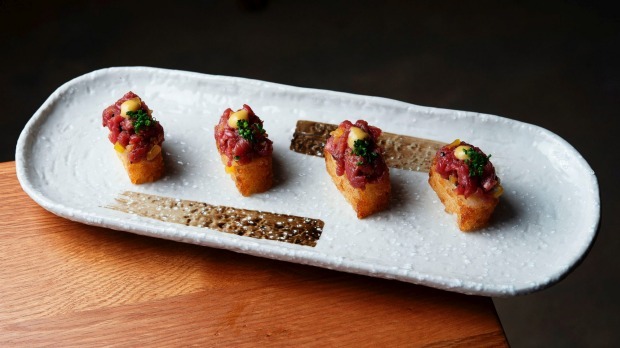 Exhibit A: the grass-fed beef tartare crispy rice sushi ($16 for four), which is just the right combo of richly seasoned beef on still-warm, deep-fried logs of sushi rice, topped with a splat of honey mustard. 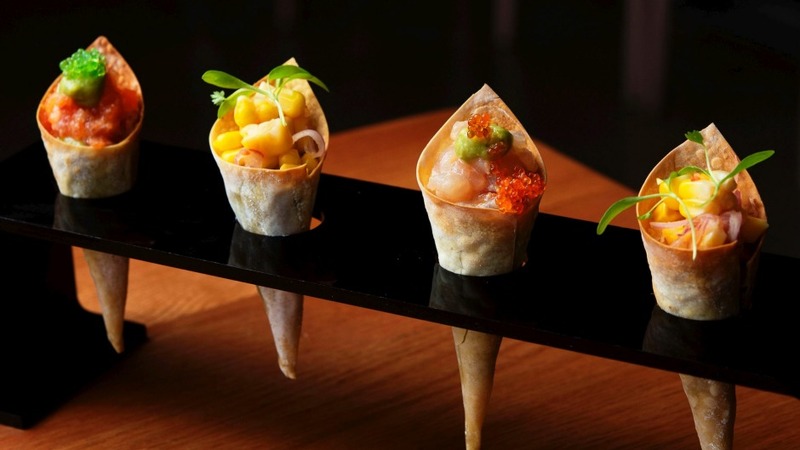 And B: biscuity little sashimi cones that carry kingfish, avocado and wasabi tobiko, or salmon, avocado and orange tobiko ($12 for two). Very cute, and just the thing with a "Japerol" spritz ($17) or a "gin bowl" of Manly Spirits Co. Coastal Citrus Gin with PS40 Bush Tonic and enough salty, succulent beach banana to turn the glass into a terrarium ($19). The kitchen is proud of its take on nasu gengaku ($16) in which tempura eggplant cubes nestle inside a bowl of tempura'd eggplant. Like so many fusion Japanese dishes, it's kitsch but strangely pleasing. 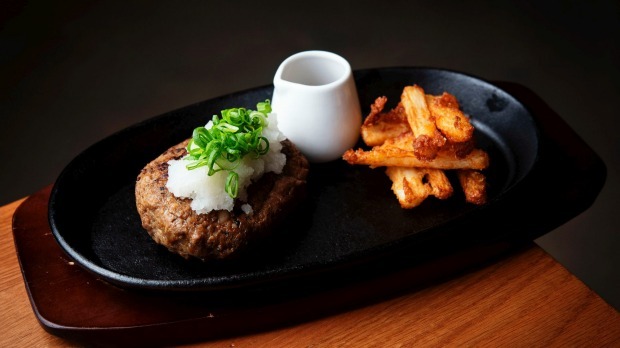 Another new dish, the "grandmaster sizzle" ($26) will strangely-please the burger-lover with its pan-fried pork and beef burger patty teamed with oozing mozzarella, grated daikon, and pile of sweet yam (satsumaimo) fries. Not sure where it's coming from, myself, apart from the same country that loves wasabi-flavoured Kit-Kats and curry chicken schnitzels. Quite correctly, any nigiri sushi comes as the final course; and is pleasant without being exciting. 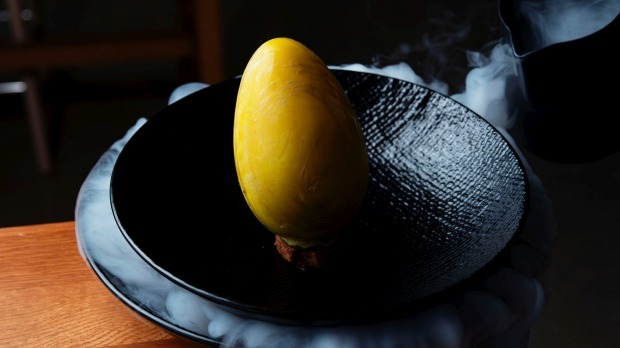 Most Saturday-nighters end on Sake's ever-evolving dragon egg, currently a riff on banoffee pie with its white chocolate shell filled with roasted banana and rich hazelnut and banana cream ($23). Pour on the hot miso caramel and the shell implodes in spectacular fashion as if auditioning for MasterChef – and you'll be on a sugar high until Christmas. Yes, it's big – possibly too big – and there's little that's intimate or personal about Sake Manly, as 300 loud and lively people get together over upscale izakaya food and cocktails by the sea. But the "go big or go home" mantra creates its own high-energy buzz that's a real crowd-puller. Lucky it's a crowd pleaser, too. Vegetarian: A scattering of dishes includes vegetable tempura, avocado and cucumber maki roll, kimchi fried rice, vege cones, robata corn, wafu noodle salad, seaweed salad and spicy brussels sprouts. Drinks: More than 30 bins of sake, 30 distillations of gin, blitzes of spritzes, four bespoke gin bowls, Japanese beers and a 150-bin wine list that runs from a $48 Jim Barry JB Riesling to a $455 Krug Grande Cuvee champagne. Pro-tip: Sundowner sessions are the new happy hour – 5pm-6pm, Monday to Wednesday – for $10 spritzes by the sea.